Have you ever had molten adhesive on your skin? 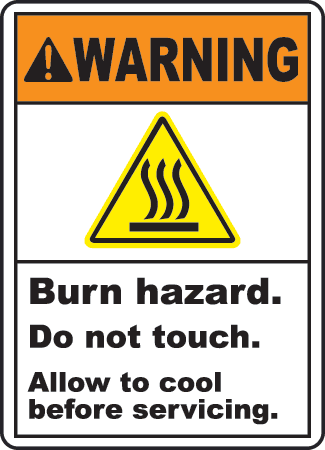 If you have, "Hot, do not touch" is an understatement to you. This first thing we want to do it wipe if off. Resist that urge because you will just spread the molten glue to more skin! Immediately cover affected area in clean cool water. Seek medical attention for removal of glue to avoid deep skin removal. Before working on any hot melting equipment, such as Nordson, Valco/Melton, ITW, Slautterback or even a small simple glue handgun, be prepared. Make sure to power down the equipment and give the equipment time to cool. If you need to remove parts, use safety gloves and the proper wrenches. Since glue machines are under pressure, be sure to turn off the pump pressure before removing any parts to avoid a burst of adhesive.